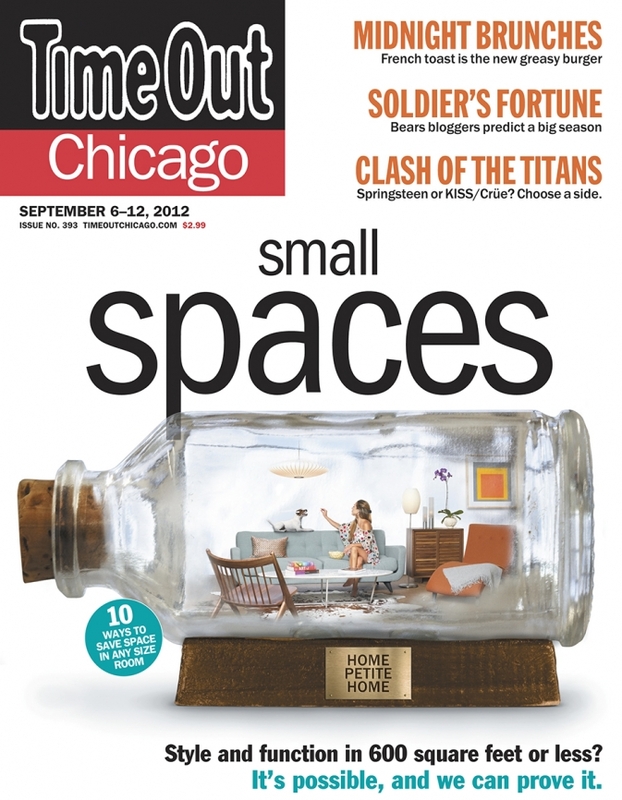 This week’s cover of Timeout Chicago features a FUN!! photograph of my friend and fellow tango dancer, Romina Giffi, and her “dog” …. in a bottle. It’s for the Small Spaces issue that looks at creating stylish yet functional living spaces in less than 600 square feet. Yep, that would be a room 24′ by 25′. Two rooms 15 x20. Roughly 2 semi-truck trailers side-by-side. In a word: SMALL. Or rather: small. The art direction behind the photograph was how to articulate this feeling quickly and clearly. A girl in a bottle? A girl in her apartment… in a bottle? A girl in her apartment? With her dog? In a bottle? The element that I thought was really important was giving the bottle space and breathing room. If you look at ships in bottles (say … on your Hemingway-loving grandfather’s mantel) you’ll see that the ship is rather cramped. It comes with the thought: how the heck they get that in there? For this photograph, I felt it important for there to be space. Albeit small, the space in the bottle needed to be ample. Inviting. And fun! I really wanted it to be fun! And what better fun than popcorn-catching dog tricks? A very big Thank You to Deana Cizek and Andrew Augustin of Chicago’s Room & Board Showroomwho gave us free reign on an early early Sunday morning to create our perfect apartment in a bottle. To Jenn Lake of Zapwater Communications who helped connect me with the lovely people at Room & Board. And especially to the lovely Romina Giffi, who had the perfect matching outfit for our apartment. And checkout the little rough-and-tumble version of the forthcoming behind-the-scenes video where we see how she really connects with her pooch. It’s true love …. and fun! And finally to Champ. Awesome work!